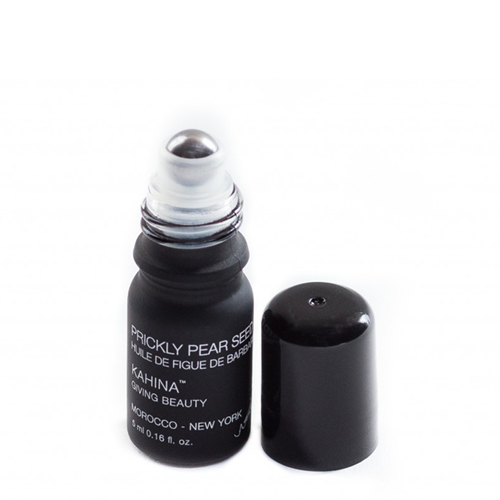 Prickly Pear Seed Oil Rollerball by Kahina Giving Beauty is both pure and organic and is prized for its ability to lend a smoothing and regenerated look to skin. With vitamin K and E, this product is perfect for targeted application on the eye area to help reduce the appearance of under eye dark circles, and make skin look moisturized and youthful. A finite resource, Kahina Giving Beauty bottles the precious first pressings of this green elixir from the seeds of the fruit at its source. With an easy-to-roll on bottle, you won't waste a drop of this potent oil, and will enjoy the feel of smooth, soft skin. Apply as a daily and nightly eye serum under or in place of your eye cream. Gently roll under eyes, along the nasolabial folds (laugh lines) and anywhere that can benefit from the look of extra smoothness. Roll on to improve the look and feel of severe dry skin patches.